Effective for students applying to UC in November 2014 for freshman admission in fall 2015, one full year of Geometry must be completed to satisfy the mathematics (“c”) subject area requirement. In other words, even if students complete three year-long math courses, they will not have fulfilled the mathematics subject requirement for UC admissions unless they have taken, and passed with a letter grade of C or better, one full year of Geometry. As a result of the revised mathematics subject requirement, the omission of a Geometry course can no longer be validated by higher-level math courses, such as Algebra II/Trig, Trigonometry, Math Analysis, Pre-Calculus, or Calculus, taken at the high school or college level. Furthermore, the omission of a Geometry course cannot be validated with any examination score. UC faculty have determined that an examination score (SAT/ACT, SAT Subject, AP, IB, etc.) cannot validate the omission of a Geometry course. This includes “challenge” exams taken to demonstrate proficiency in a subject for which a student receives only a Pass or Fail grade. If, however, based upon a challenge exam, a high school awards both grades and units for the completion of Geometry, UC would consider that course omission validated. A student can use a non-transferrable college/university course in Geometry to satisfy the requirement. However, advanced courses in mathematics, even those that are UC-transferrable, will not validate the omission of a Geometry course. UC will continue to allow students to self-report on the UC admission application a Geometry course completed in grade 7 or 8 to meet the mathematics (“c”) subject requirement. UC will not require the submission of a middle school transcript, nor will high schools be required to list middle/junior high school math courses on high school transcripts, but doing so is recommended. Last night, I watched my son perform in the high-school play for his home-school umbrella school (Alternative Family Education). The parents’ club hires West Performing Arts to organize the school plays (they had three—elementary, middle, and high school) and provide the performance space (West End Studio Theatre). The high school production this year consisted of 8 one-act plays, seven of which were from David Ives’ collection All in the Timing,hence the name “Mostly in the Timing”. The one exception was a sketch from the Carol Burnett Show (episode 10.6 in 1976, of two people in an elevator with one-word lines). I had not seen any of the plays before—I’d not even run lines with my son for this production, so it was all new to me. I enjoyed all the plays, though “Degas, C’est Moi” needed some more rehearsal, particularly for the stage crew. I can see why these pieces by Ives are so popular for high schools and colleges—they are funny, well-written, and fairly easy to stage, relying on the lines and the acting, rather than on sets, costumes, or props for the entertainment. “Variations on the Death of Trotsky” Leon Trotsky with axe smashed into his skull. 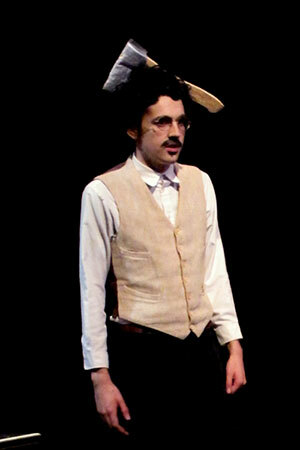 My son was in five of the eight one-acts, with one of them being a last-minute casting after another student dropped out of the production. He had the role of Frank Mikula, a construction worker in “Mere Mortals”; Horace, the male mayfly in “Time Flies”; Leon Trotsky in “Variations on the Death of Trotsky”; Collin in “Elevator”, and Pedestrian and Unemployment Worker in “Degas, C’est Moi”. This required some quick changes of costumes and some radically different body language for the different parts. They had 11 actors and 3 directors (for a total of 13 students, as one director also acted) for a total of 38 roles. My son ended up with the most roles and the most lines, probably as a result of stepping in at the last minute for the role of Frank Mikula. My wife made the ax-in-the-head costume piece for Leon Trotsky. They debated for a while whether to shape it like the mountain-climbers’ ice axe that the script calls for, or a more iconic wood-chopping hatchet (which seems to be the more popular choice for staging the play, based on Google image searches). They went with the hatchet. It was constructed out of old padded envelopes, cardboard, and duct tape, sewn to a wig. It ended up looking pretty good, and it did not flop over (which is what my wife was most concerned about). Frank Mikula (left) and Charlie Petrossian (right) eating lunch 50 stories up. Mayflies Horace and May, discovering that they’re on television. They have another run this afternoon, and I look forward to seeing it again. 21–22 December 2013. My son performed in “Inspecting Carol” as Sidney Carlton (hence, Jacob Marley and Fezziwig) with WEST Ensemble Players at West End Studio Theatre. 30 Dec 2013–3 Jan 2014. My son had a 3-day workshop with West Performing Arts on “site-specific theater” which included street performances downtown. 10 Jan 2014. 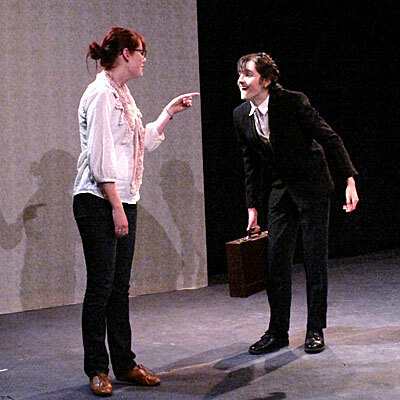 We went to see “8 tens at 8”, a collection of new one-act plays performed by Actors’ Theatre at Center Stage. 18–19 Jan 2014. My son performed in “Call of the Wild” at West End Studio Theatre as John Thornton, a husky, and a narrator. 20–24 Jan 2014. Tech week for the AFE high school play with 3–6 hours of rehearsal a day. 25–26 Jan 2104. 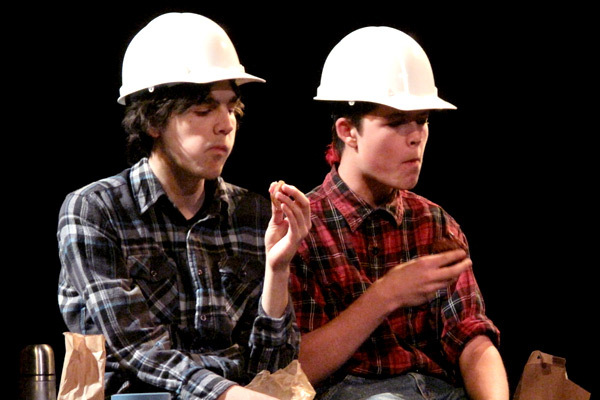 Performance of the AFE high school play at West End Studio Theatre. They are doing 8 one-act plays, mostly from David Ives’ collection All in the Timing, so they’re calling the performance “Mostly in the Timing”. My son is in 5 of 8 one-acts, with one of them being a last-minute casting after another student dropped out of the production. 1 Feb 2014. Going to see “Best of the Rest”, a staged reading of the 8 10-minute plays that did not quite make the “8 tens at 8” by Actors’ Theatre at Center Stage. 2 Feb 2014. 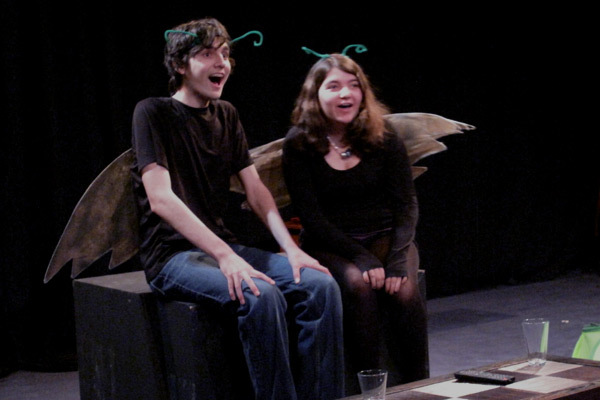 My son will be performing with Dinosaur Prom Improv at Broadway Playhouse. There was one serious conflict this week, with auditions for “Much Ado About Nothing” (the Spring play for the WEST Ensemble Players) at the same time last night as one of the “Mostly in the Timing” tech rehearsals. My son really wants to play Benedict in “Much Ado” (he’s never gotten a romantic lead, and Benedict is probably the best-fitting romantic lead for him), so missing the auditions was painful. Luckily the director for “Much Ado” was at the “Mostly in the Timing” rehearsal the day before, so was able to propose an alternative way for him to audition. Today he has 6 hours of dress rehearsal for “Mostly in the Timing” plus an hour an half of practice with Dinosaur Prom—I don’t know when he’ll have time to do his AP chem homework. At least the college application essays are over with. One of the big advantages of home schooling is the ability to adjust schedules so that intense weeks mostly dedicated to one activity are possible. Things should quiet down after next week, with just “Much Ado” rehearsals (3 hours a week) and Dinosaur Prom (1.5 hours a week), though there will be a workshop on doing auditions sometime this spring. Community-wide the big theater news is that Shakespeare Play On has raised pledges of $697k in a month and only needs to raise another $188k (in the next week) to keep the summer Shakespeare tradition in Santa Cruz alive. I really hope they make it, as Shakespeare performances have been one of the big highlights of the summers here for as long as I’ve lived here.